A writer and horse lover (animal lover) at heart. With a few year's exception, I have mostly worked outside the animal field. I am pretty good at what I do. But at the end of day, I want to be with the horses, cuddle with the dogs and sit quietly as the sun goes down with a cat on my lap. Spending time with my family and especially my grandchildren is number one for me. My little farm gives me a perfect life. I have asked myself many times, what is my earliest memory? You have to be careful because sometimes it is not the memory itself but a picture which becomes familiar and we think we remember something we do not. I am not sure what my earliest memory is, I have some from age three and four but I clearly remember getting the dog above (or one that looked a lot like him) for my fourth birthday. I celebrated my fourth birthday in a hotel outside Chicago. We were waiting for our house to be built and lived for awhile in the Park Ridge Inn. Things were overwhelming then as we had just moved seven times in one year (and across the country like from Denver to Washington D.C. and Pittsburg to Chicago). I grabbed onto this dog whom I quickly and intuitively named Brownie (I was sharp like that) and I did not let go of him until he was but a shell of a dog casing. When all the world was crazy, Brownie was one thing that was the same. He slept under the crux of my arm each night. I cradled him in my arms. One time in third grade when his ears were worn away to nothing, I decided to cut all the remaining hair off and glue yarn on instead. Really stupid idea. The old ears were velvety smooth, the new ears rough with glue and not at all satisfying to the Cindy that needed comfort. I left Brownie behind somewhere between college and moving all over the US. Since that time I have not had anything to keep me company on such a regular basis as that old stuffed dog. While clearly I have had lots of pets, none of them fit that spot between my arm and my side until now. 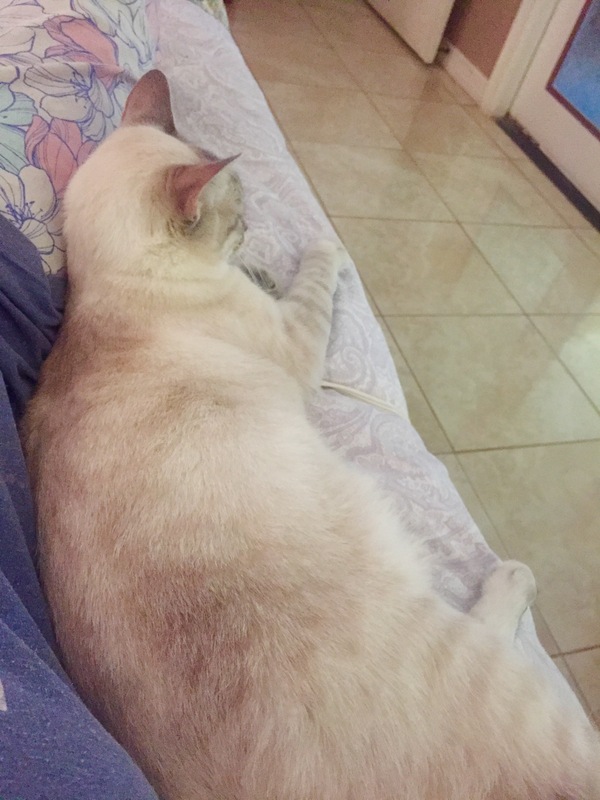 In the fall, I came home with two Siamese mix cats, Izzy and George. Izzy, I say, is my soul mate as she always seems to know when I am sad or could use a friend. 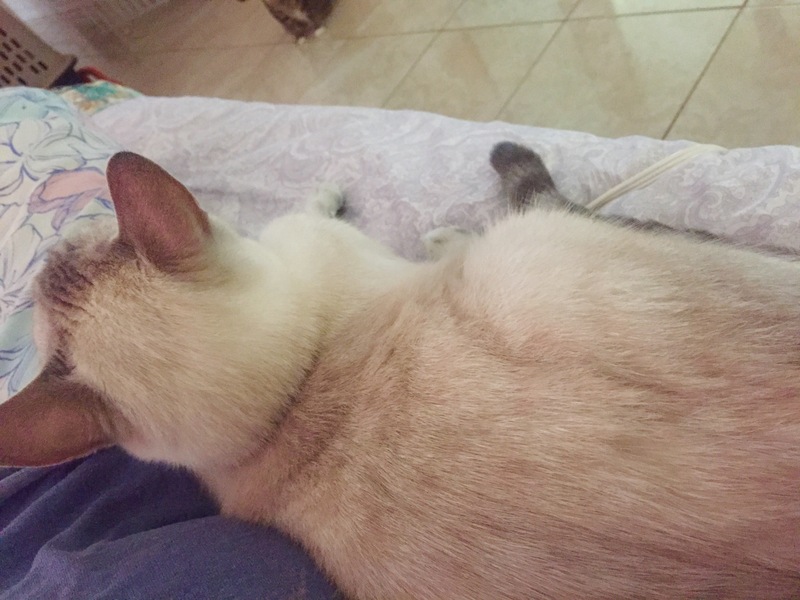 Izzy, like Brownie before her, fits and sleeps in that space near my heart keeping me safe and content. I don’t know what made me think of Brownie after all these years but maybe it was just having Izzy’s warm presence in these quiet, post-surgical days as I have spent some extra time in bed getting stronger. I wish I could take a picture at night so you could see how perfect we fit one another but you will have to be content with the day version picture. Oh, Izzy, how lucky I am to have found you. On just another afternoon at the house, here in Southeast Texas, I was inside resting after another shortened day at work as I am recovering from surgery. Suddenly, I heard a horrible thumping noise directly outside my bedroom windows. I knew it was the air-conditioners. We have two units located directly in my backyard behind my room. I rushed outside already dreading what I would find and hoping it was not a broken air conditioner unit. Replacing anything of that magnitude is not in my budget right now. As I came around the corner I heard a horrible hissing noise like the whole unit was shutting down. I went back to the house and yelled for Lauren to see if she could come and look at the unit with me to see if there was anything that we could do. As I waited for her to come down I saw what had caused the unit to stop working. I was a little excited to show Lauren as I knew it would scare the crap out of her. 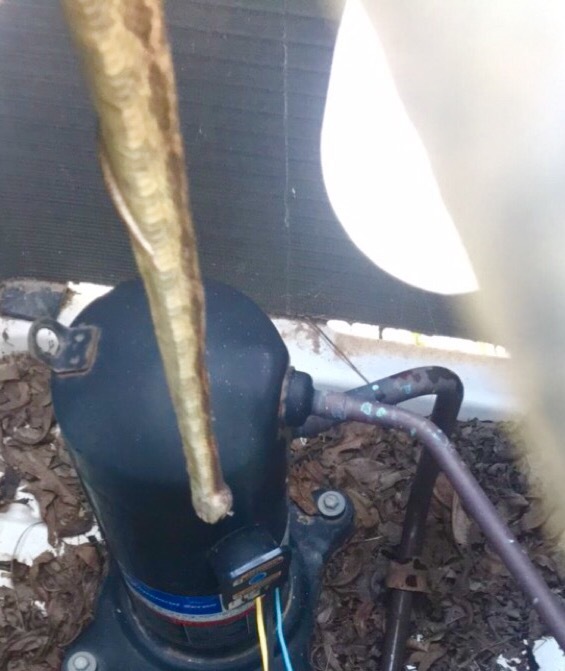 I could see what was at least a 5 foot water moccasin snake completely wrapped around the center of the fan blades in the air conditioner unit. Lauren, of course, had my desired screaming affect when she first saw the snake dangling from the fan blades. But then reality set in on how we were going to try to fix this. We looked originally to see if there was someway we could take the top off the unit and get to where the snake was tangled in the hardware of the fan. 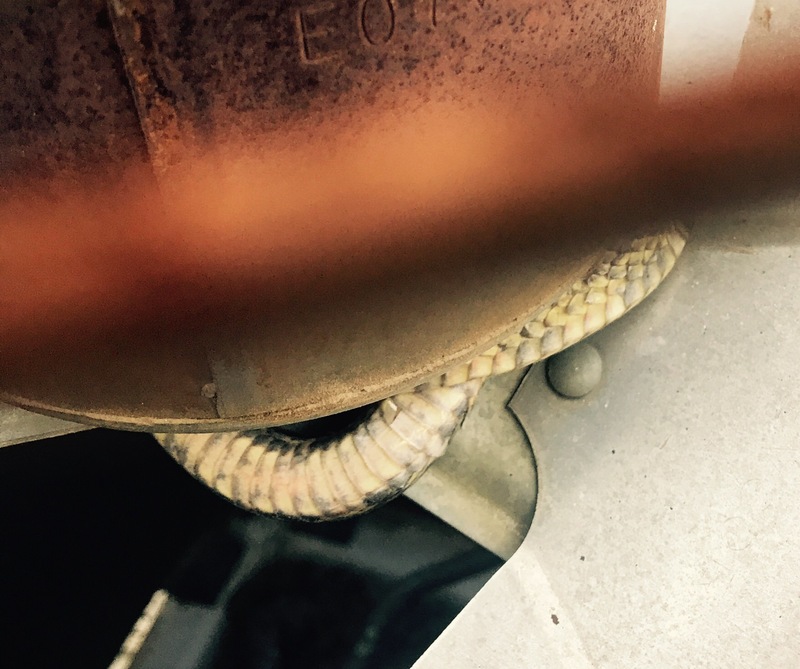 We decided we had to get something long enough to reach in through the metal bars of the top of the air-conditioner unit and be able to untwist the snake from his roosting spot inside the air conditioner. The only thing Lauren and I could find to untwist the snake with were some long kebab skewers that sat in our kitchen drawer. First being smart enough to turn off the electricity we went out to try to undo the snake from the gears. And what we thought was a very delicate procedure where we would take the snake and both of us would hold it and twist it around the center of the blade until we got it around to the other side where we would untwist the body of the snake from his tail. It appeared that he was twisted three times, in and out, up-and-down, as he made his way around the inside of the air conditioner. In a process that took us about 45 minutes, with Lauren screaming every time she put the skewer through the dead snake, we finally got the snake undone and he dropped to the bottom of the air conditioning unit. We went back in the house, push the power back on and waited to see if the air conditioning unit would come to life. It did. I huge sigh of relief came from both Lauren and myself as we thank God for a good luck. I went back to my spot on my bed happily hearing the air conditioner running outside my window. I actually got a little bit of rest before the TV alerted me to an immediate tornado warning in Richmond, our hometown. Then Lauren, the five dogs, five cats and I hung out in the interior hallway for the duration of this very frightening tornado that touched down very close to our home. We were all safe, thank God again. I’m telling you, we need a reality show. Flagmount’s Semper Fi is one year old today. He is happy, healthy, laid-back and big for a yearling. The breeding we thought might produce a tall, quiet horse with an ability to jump is a year into life and we are pleased. I wanted to offer up this flashback from one year ago as baby Sims (named for Sherre Sims, if you were blessed enough to know her) came into the world. As final exams and tests explode in house’s everywhere here is a testament to study. Sunil Bali’s post provided some fodder around the study drills and their impact on our creativity levels. I thought you might enjoy his enthusiastic take on the beginner’s mind. If you went to school in England, the chances are that you’re familiar with the fact that King Harold of England was shot in the eye by an arrow in 1066. I can safely say that in the 40 years since I learned of Harold’s hapless demise, this fact has been of no use whatsoever. The saving grace when I was taking my school exams was that whilst I was required to regurgitate countless facts, at least I wasn’t living in today’s age of infobesity, infoxication and information overload ….. drowning in a sea of self-promotion and sound bites. As we’re growing up, school, society and then often the workplace, educate us out of our creativity. Paul Linley, the multi-millionaire founder of children’s food company Ella’s kitchen, says that “grown-ups need to grow down” because when we’re born, we’re all creative geniuses and master negotiators, able to capture anyone’s attention. Unburdened by the would, could and should of adulthood, children look at the world as a playground full of wonder, opportunity and joy. In the foreword to Linley’s book, Little Wins, Sir Richard Branson says that recapturing the wild eyed enthusiasm, warmth and determination of your toddlerhood – or as Zen calls the Beginner’s Mind – is the path to a successful and fulfilled life. I have four grandchildren. The oldest, Jordyn, is nine. Next, my only grandson, Riley is seven. Then, is Lexi who is five. And last but certainly not least, is Kendyll who is four. Their parents, God bless them, give their children opportunities to excel in sports and in school. All four of the children are doing well in their sporting events this spring. I thought I would take just a moment to brag on all of them. 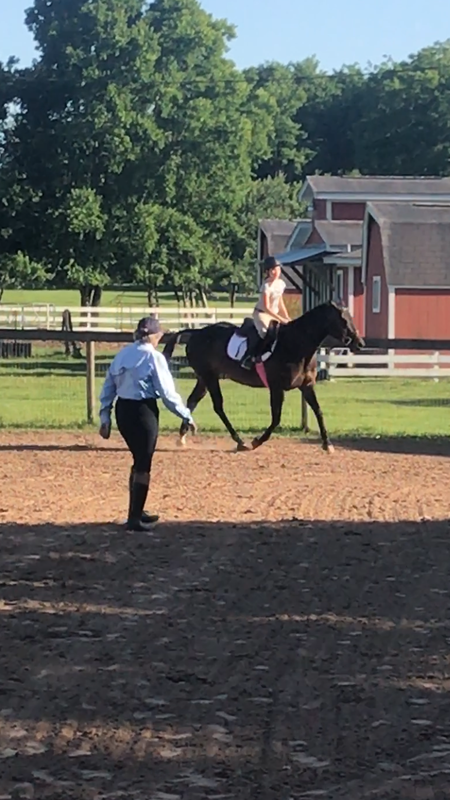 First, Jordyn, is really getting used to her new horse Poppy. Poppy is to be the grandchildren’s horse but Jordyn is the one taking the first rides. 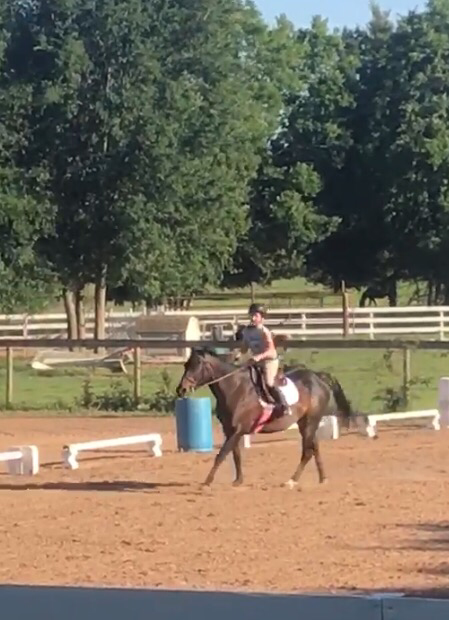 By this weekend she was cantering over and over, picking up the correct lead and perfecting her style within just a week. The little Poppy horse has entered all of our hearts. Next out in Brighton, Colorado seven-year-old Riley has been tearing up the baseball field. He has had a hit at every single game he has played this year I know his grandpa Dave is very proud of him. Baseball/softball was such a huge part of our life with Amber as she grew up playing with her dad coaching. Seems like her son has the same genetics. As we all know it is hard especially in varying weather conditions, extremely cold days, warm days, windy days, to always get up and hit that ball. But that is exactly what Riley has been doing being one of the most consistent hitters is on his team. I am very proud of him myself. Lexington, pretty much the queen of her kindergarten class, ask anyone in the class- I’m serious, is also preparing for a dance recital right now. Lexi loves the costumes, the music and her simple ability to just dance her heart out. I wish I could be there for the recital. But I’ll look forward to seeing it Lexi on video when I can. 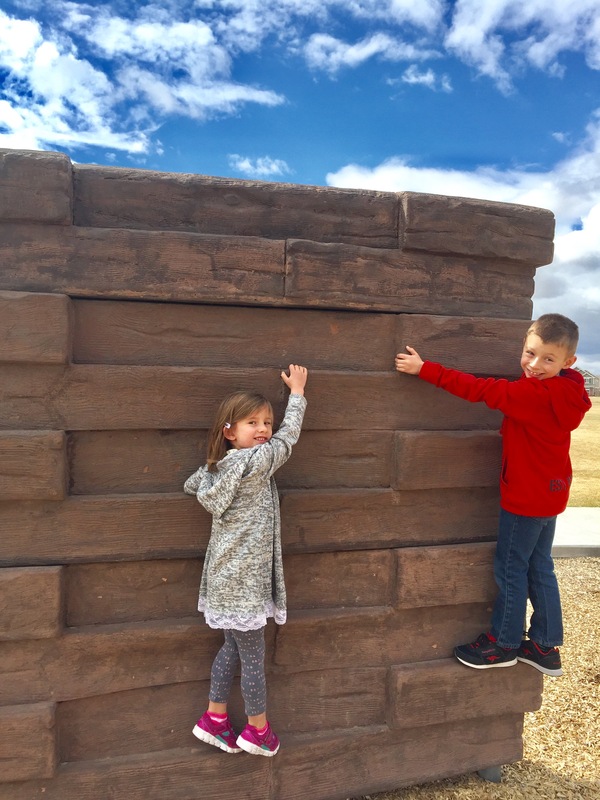 Riley and Lexi are also working on their upcoming Spartan race as they prepare to race across varied terrain and over and under many obstacles. Lexi and Riley practicing the obstacle wall. It’s up and over folks. 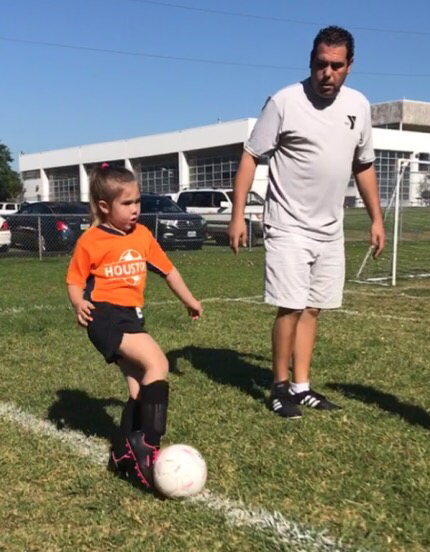 Finally, four year-old Kendyll has been playing soccer this season. At first it didn’t go so well. It was really a lot of work running up and down that field and working the ball wasn’t too easy either. But Kendyll, I think, is a natural athlete and bit by bit she got the idea of what was supposed to happen on the field. It is also helped that I have been out of commission the last couple of weeks. Kendyll would come over while I sat in a chair to defend the garage entrance and Kendyll will try to kick the ball past me as I sat in the chair. That should be pretty easy right? Actually Kendyll learned a lot from the exercise, doing it over and over again till she got it right. At her game this weekend she got her very first goal! I am very proud of her performance as well. It is amazing what happens when you give kids goals and opportunities to meet their goals. I love these babies so much and I’m so proud of them. Day by day, I have been getting a little stronger and walking about a little further. I have had some great visitors that have filled up the hours and some beautiful flowers that are filling the air with sweet scents. Thursday Ally was over early to mow. She thought she saw a small dog at the top of my neighbor’s driveway. Lauren came back from her trainer’s around noon and spotted the same little one lying deathlike in the driveway. Lauren went to investigate and found the neighbor’s other mini-pony had given birth but mommy and baby were separated and the baby was much worse for not having mommy by her side and milk to drink. A little investigation found the first time momma with her placenta half-delivered locked away down in the pasture. The baby had wondered up to the road herself. Lauren would have investigated more but for the bull that chased her out of the pasture and through the wire fence. It had been a brutal week for Lauren anyway having suffered a badly injured forearm that took her to the ER and a fall through a palm tree (you do not want that story) so getting chased by the bull was icing on the cake. Lauren and Ally teamed up with our neighbors to try to help out the tiny baby that was quite dehydrated at that point. Couple with a syringe and water, the foal got some much needed fluids and started to gain back some ground toward living. Lauren kept mumbling that she wanted to take the foal on the road with her to Tyron (North Carolina where she is headed to show this next week) and I was was fine with that but I was not agreeing to nurse it around the clock. The owner of the property and mare were gone and not reachable to help us save the baby. The girls called the sheriff’s department and four officers arrived pretty quickly. They took the baby in their arms and went in search of the new momma still hoping she would accept the baby and the baby would have a chance. We all left out about that time leaving the matter in the capable hands of the officers. 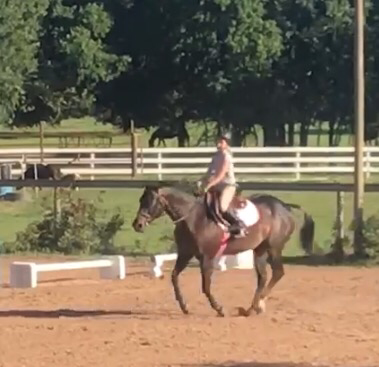 Last night Nancy arrived for Jordyn’s lessons and I was telling Jennifer about the bad news of losing the little foal when our eyes were riveted towards the little sorrel pinto streak of a foal galloping next to her momma in the next pasture. Never did I expect this baby to live and flourish. I guess she just needed a chance. Thank you ladies for work well done in his service!